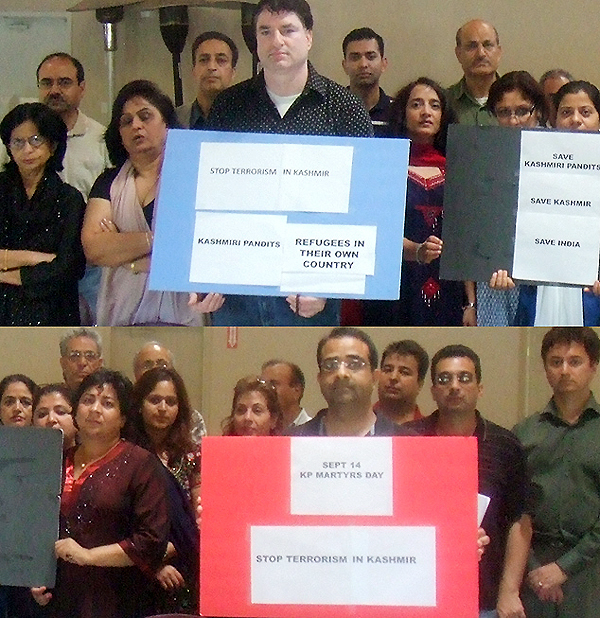 In Northern California, in the city of Fremont, USA, members of the Kashmiri Hindu community gathered in Fremont temple at 4:00 PM, displaying placards, distributing flyers, and educating others about the plight of the Kashmiri Pandits. A roundtable conference was held inside the temple community hall to discuss the current state of affairs in Kashmir. The meeting opened with recitation of an article on Balidan Divas, which was sent for the occasion by IKF member in Delhi, Mr. T.N.Dhar 'Kundan', also a writer. The members of Kashmiri Hindu community condemned this report and were outraged by the malicious lies spoken by Kashmirwatch.com. It was decided to file a lawsuit against this bogus media outlet of terrorists. Ironically, while attacking International Kashmir Federation (IKF), the writer agreed that 209 Kashmiri Pandits were murdered by militants. The IKF advisor communicated with the gathering through an e-mail and remarked "The writer of Kashmir Watch, in writing, agrees that Terrorists in the Valley killed at least 209 Kashmiri Pandits. The names of these tragic victims are in the public domain. Given his supernatural resources inside RAW who have informed him that they are funding IKF, it should certainly be easy for him to identify which security agencies these Pandits were supposedly working for? Failing this, the writer should reflect on his own factual admission and where it positions him in civil society given that he has portrayed these innocent members of society falsely and tried to justify an unforgivable crime." "In the last 668 years there is no historical record of Kashmiri Pandits committing acts of violence against non-Pandits. The writer should reflect on the facts as to whether the reverse is true. Once he does that then he will quickly realize where the hate springs from and towards whom. It is pretty clear that the writer is not engaged in constructive writing but instead wants to whip up his own audience. The allegation of hefty sums of money being paid to IKF (to fund what activity?) is simply a technique to drive fund raising for the writer's own causes from his captive followers." "When it comes to Kashmiri Pandits the writer and other of his ilk are faced with very bad facts. It is best that they avoid throwing allegations at Kashmiri Pandits because it will only boomerang against them. By the same token it would be appropriate to bring this writer and the website to the attention of the anti terrorism authorities here in the US since he seems to have sympathies for terrorist acts and has taken the extra step of personally naming the members of the IKF for which intent one can only speculate at." The meeting concluded with a prayer for the Martyr's and was over at 6:30 PM. "For us 14th September is not a mere narrative of events but it exemplifies the collective response and resolve of the community. It symbolizes the regeneration and renaissance of our civilizational identity for it brings to the fore the ultimate quest for a dignified community life. Though the purpose also is to expose the ugly face of terrorism and its ill effects on the society, thus reveling the true survival instinct and inherent strength of the community in the process." Dr. Romesh Raina writes about the relevance of this day.